Call of Fruity… as in Call of Duty… seriously? -_- What is this blasphemy? Not cool. Not cool at all! Call of Duty is sacred! Now that we got that out of the way, there were several new displays over at Boots. They’d moved the Oh K! Beauty to a stand-alone umm… stand, by the entrance to Boots (pics at the bottom of this post) and they had a Soap & Glory display featuring the new Call of Fruity Collection (so wrong!) and another one featuring a bunch of Hair Care products all with “humorous” funny-punny names. 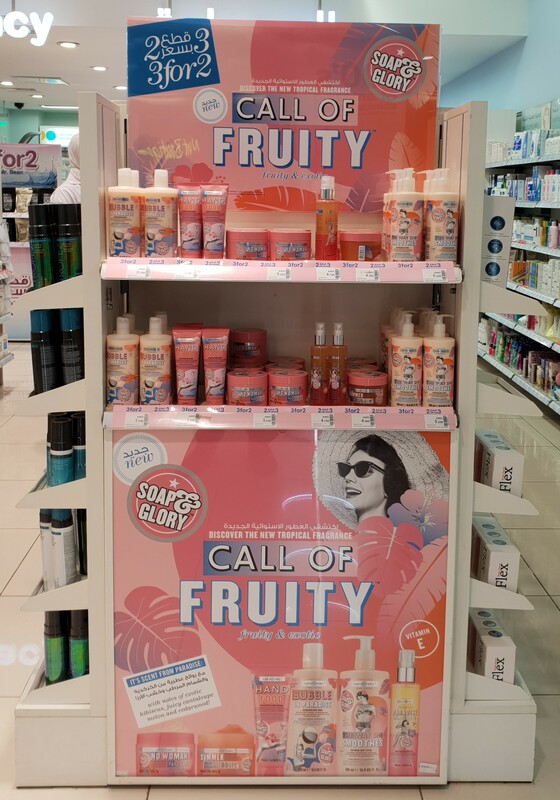 The Call of Fruity display was two rows of identical products (same lay-out, same everything) whereas the Hair Care display had more of a variety. In the interest of full disclosure, I did give the Call of Fruity stuff a sniff, but I didn’t like the way they smelled. As such, I didn’t end up buying anything. I’ll go over them anyways, for those who might be interested. 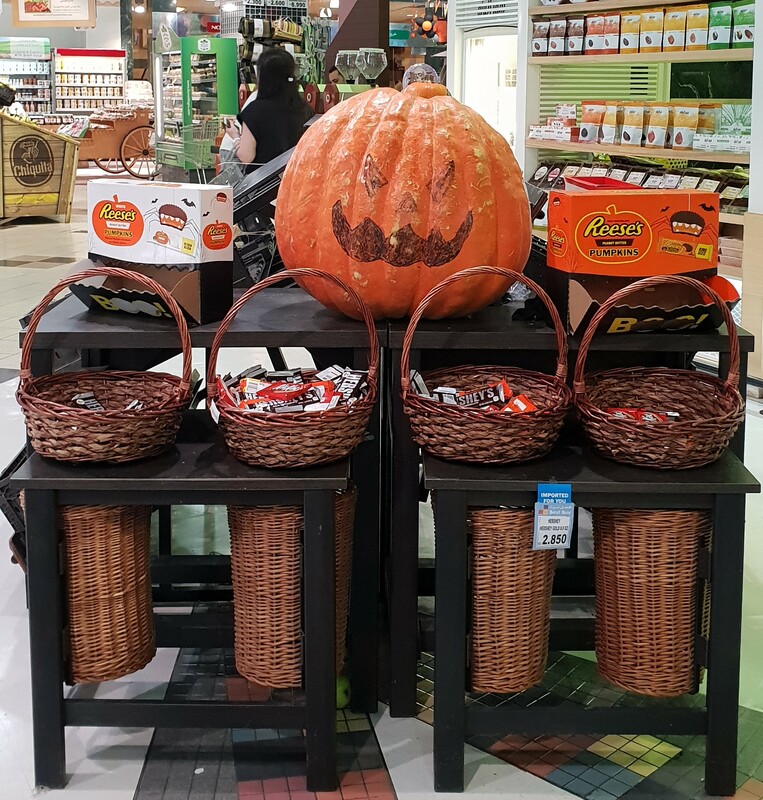 As I mentioned in my latest “Spotted at Sultan Center” post (here) I picked up a handful of snackage as well as some other random items. I’ll be referencing that post quite a bit in this post (but I won’t keep linking to it), so if you’re interested, feel free to check it out before you continue. I received a text message on July 18 that said they were giving out a free gift to anyone who spent KD 24 on the Sephora Collection which was my main incentive for going back to Sephora. However, I also wanted to pick up my Brand Gift which was between either a Becca trio or GlamGlow trio (as shown on the left and also on display all the way at the bottom of this post, here) both of which were equally awesome! I’d actually qualified for the Brand Gift by accumulating the 200 points (exactly KD 0/800 per point) earlier, on June 5 (haulage here) but on June 6 (when I went back to exchange something, here) was told I had to wait for a certain e-mail. As you can tell from the photo (on the left), eventually I received the e-mail with the Gift Voucher on June 18 (only 2 days after I e-mailed them, which was very professional of Sephora UAE and so unlike Sephora Kuwait) which meant I should’ve been able to claim my Brand Gift. Unfortunately, that was not the case. On July 20, I went to Sephora again to pick up my Brand Gift and tried to discreetly take a few photos for my Spotted at Sephora post (here) and even purchased a few of the items, to qualify for the Sephora gift with purchase as mentioned in the text they sent out to everyone. However, at the cash register, I was told that both Brand Gifts were out of stock but they would contact me once they were back in stock… if I just gave them my name and phone number. The guy at the check-out counter proceeded to pull out a rather large book already full of pages and pages of names and numbers of other people on the “waiting list” for the Brand Gift . We’ve been through this before with MAC, guys. Doing it old-school just doesn’t work, at least not in Kuwait. C’mon now, y’all are Sephora. Surely you guys have a more efficient way of doing this LOL Like I said at the start of this post, I went back to Sephora on July 20, meaning they’ve had my name and number for a little over a month now and still haven’t contacted me. 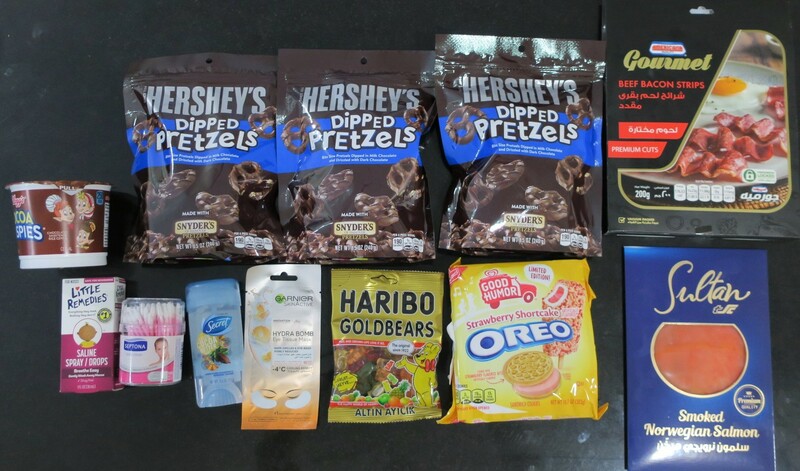 Heck, I’m not sure if they even added the points I accumulated from this haul. In any case, everything I purchased in this haul, was featured in my Spotted at Sephora (Summer) post (here).